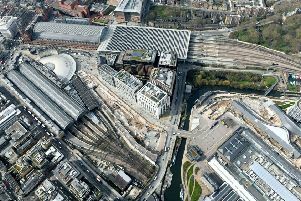 There are a number of road closures scheduled for the next few days to allow for essential maintenance on railway lines and crossings by Network Rail engineers. County highways officials state that adequate arrangements will be made to enable pedestrians to access premises in the affected area while works progress. The Burton Road level crossing just south of the A17 at Asgarby near Heckington will be closed from 8am to 4pm on June 2 and 3. Diversions will be via the A17, B1394, Burton Road in Heckington, Heckington Road and Asgarby Road in Burton Pedwardine. Kirkby La Thorpe level crossing will be closed from 8am to 4pm on June 4. No alternative routes. Sudbrook level crossing on Rookery Lane near Ancaster will be closed from 8am to 4pm on June 17. Diversion via Main Street, Carlton Road in Sudbrook, Sudbrook Road in Carlton Scroop, A607, A153 and Rookery Lane. Sleaford East level crossing at Southgate, Sleaford will be closed from 11pm on June 29 to 6am June 30. Diversions via Grantham Road, King Edward Street, Castle Causeway, Watergate/West Banks.